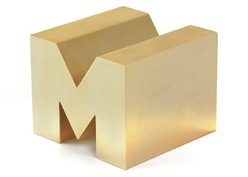 It was a golden night for the brand with the golden arches at the 91st Marketing Awards in Toronto Thursday. DDB Canada/Tribal DDB took home four gold trophies and the Best of Show honour for its work on McDonald’s Canada’s “Our Food. Your Questions” campaign. The fast food chain and its digital agency launched the campaign last year in an effort to be more transparent and put to rest some of the myths surrounding its food preparation, packaging and product launches. Consumers were invited to submit questions about McDonald’s food through a dedicated website, and the company answered with open and honest responses. The campaign generated more than 13 million video views, 132 million media impressions, 2.3 billion social impressions and answered 18,462 questions. In addition to Best of Show, “Our Food. Your Questions” was awarded gold in the Film Online: Single, Digital Websites/Microsites: Corporate, Pushing The Boundaries and Integrated Campaign categories. In another fine showing, DDB’s sister agency, DDB Tribal Berlin, won two gold awards in Press categories for its work on Volkswagen. It was also a big night for LG2, which won seven gold awards: three for its work on Société de l’assurance automobile du Québec, three for Réseau de transport de la Capitale and one for Lunetterie Sears. BBDO won three golds for Wrigley’s “Touch the Untouchable” campaign – an extension of the “Touch the Rainbow” videos that encouraged viewers to put their finger on their computer screens to “intereact” with humour video. The “Touch the Untouchable” campaign introduced viewers to mystical characters such as a werewolf baby and Cyclops doctor. Anomaly won gold in both the Integrated and Pushing the Boundaries categories for Labatt Breweries of Canada’s wifi-enabled replica hockey goal lights, which flash and blow a horn whenever the user’s favourite hockey team scores. Taxi Canada‘s Pothole Season app, which let Montrealers track road conditions and report potholes through their smartphones, won golden Ms in the Self-Promotion and Digital: Apps/Mobile competitions. Rounding out the list of multiple gold winners, Grey Canada won a gold in the Digital Online Campaign and Digital Best Use of Social Media categories for The World’s Most Valuable Social network, its online work with Missing Children Society of Canada. 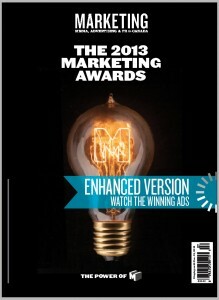 The complete list of winners is available in the 2013 Marketing Awards book, available now on newsstands and on the iPad. The ACA gold medal presentation, which recognizes an individual who has made an outstanding contribution to the advancement of marketing communications in Canada, was also made during the evenings award gala. This year the honour was bestowed on Philip Donne, president of Campbell Company of Canada. During his 11-year tenure at Campbell, Donne has helped put into place corporate social responsibility and health and wellness initiatives that benefit the company and the community. “[Donne] is an ardent believer that corporations and their employees – from the plant floor to the executive suite – must strive to do the right thing because it’s the right thing to do,” said Ron Lund, president and CEO of the ACA. “With Phil’s guidance, Campbell Canada has set the pace as a company whose core values include a commitment to provide Canadians with healthy, affordable and delicious food choices, from its iconic Campbell’s soups to its Pepperidge Farm baked snacks and V8 beverages,” he added. More than 1,700 entries were submitted to the 2013 Marketing Awards across 60 categories. That submitted work was scored online by a jury of nearly 52 leading creatives across the country. The co-chairs used those scores to determine the shortlist of work debated, discussed and ultimately voted-on by a live jury of 16 creatives over two days in April. Want to watch all the winning TV ads? Hear every gold-winning radio spot? See the fantastic public service spots that will have the industry buzzing all year? 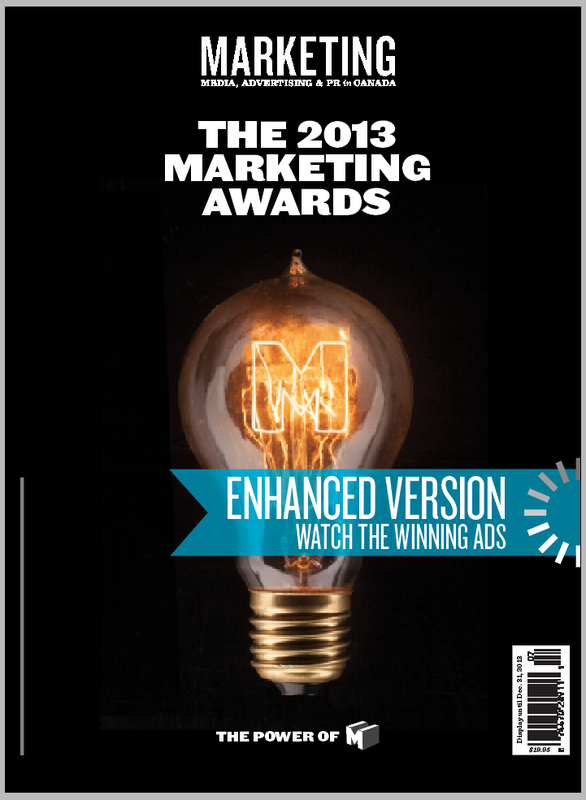 The 2013 Marketing Awards Book: Enhanced Edition will be available on your iPad on May 31. It’s the perfect complement to our annual printed awards book. Check Marketing‘s “special issues” section in the Apple Newsstand. This story can be found at: http://marketingmag.ca/advertising/our-food-your-questions-wins-big-at-2013-marketing-awards-80094.